Some moms are crafty, some aren't. Some moms enjoy baking cakes from scratch, some don't. 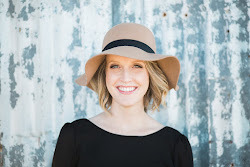 I have planned and hosted birthday parties for my kids at home, and I've planned parties that we hosted somewhere other than my home. In total I've planned 7 parties, and I will be throwing many more in the years to come. 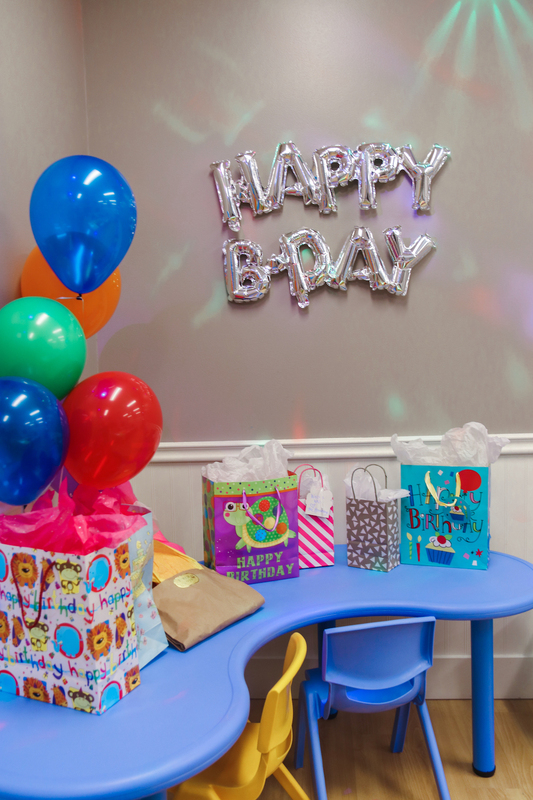 I'm sharing a look in to how to throw a stress free party and a recap of Walt & Whitney's second birthday party at Catch Air in Round Rock! The older kids get I believe the easier parties get. Why is that? It's not like they care when they are young? Why so much effort in the early years? I'm excited for slumber parties, and birthday trips to the mall. Here are the major factors that come in to play when I'm deciding what type of party to throw. Some years I've decided to host in my own home, and some years I've let someone else do the hard work. A few questions to ask yourself...How many people do you plan on inviting? Will there be more adults than kids? What will the weather be like? Walt and Whitney's birthday is in January, so it's usually pretty cold outside. That takes away my opportunity to have it at a park or anywhere outside. This year I chose Catch Air to host their 2nd birthday party. I knew we'd have lots of kids, and being cooped up in my house would be a nightmare. 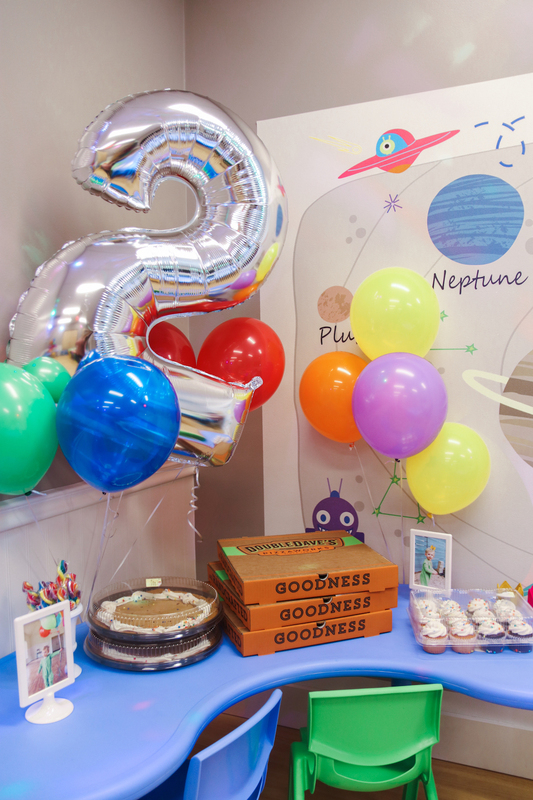 We hosted Turner's 4th birthday there and loved it! As you know the cost of a party can quickly add up. Decorations, plates, cups, drinks, party favors, food, activities for the kids, etc. 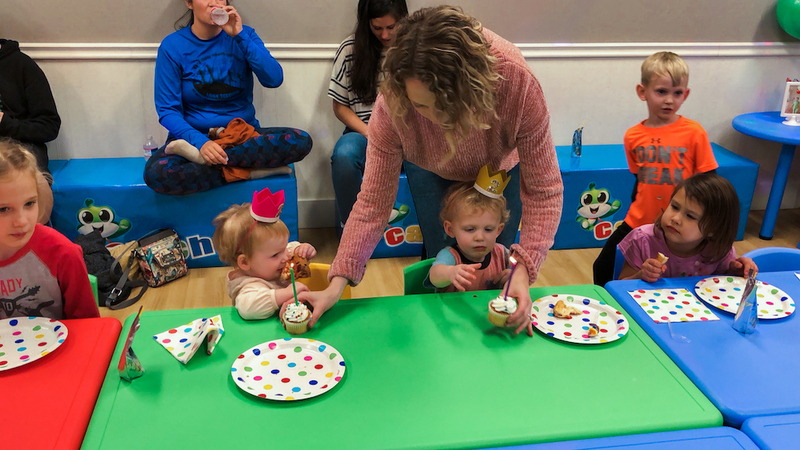 Parties at play centers aren't cheap, but they are totally worth it in my opinion. 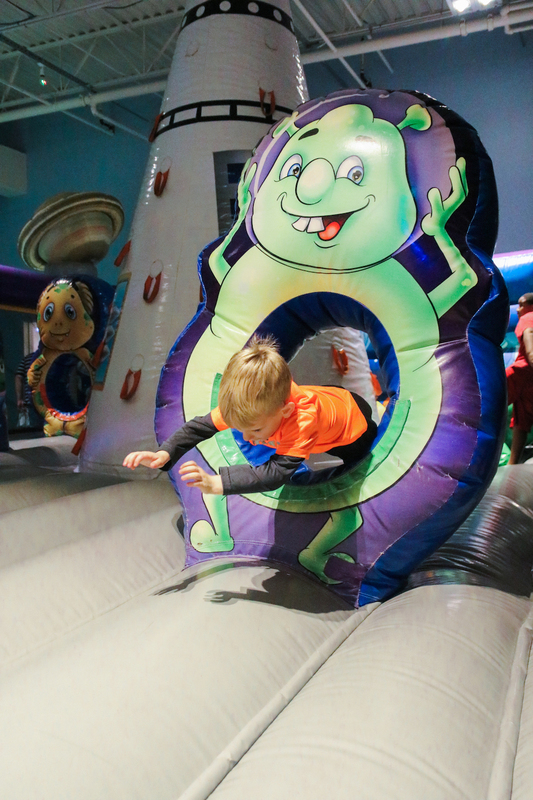 The kids always have an amazing time, and as a parent I appreciate a party where my kids can try a fun activity and get their energy out! For Turner's 5th birthday we had a simple party in our front yard with our neighbors. Pizza, drinks and cookie cake. The only decoration was a giant balloom in our front yard. Turner and all the kids had a blast playing together and the weather was perfect! You don't have to spend a ton of money to have a good time. How much time and effort I can commit to planning a party plays a BIG part in where I'm hosting it. When I only had one child, a DIY party at home wasn't a problem. After twins, I wanted someone else to do the hard work. You have to know naturally I like to throw big parties, and I love hosting but sometimes it makes me crazy! Crazy because I want to make cute snacks, make DIY decorations, and clean every inch of my house. The days leading up to a party at home, I'm running errands like a mad woman trying to finish every last detail. Don't feel guilty buying the store bought decorations or food. This year we bought cookie cake and cupcakes from HEB, and boom I was done! 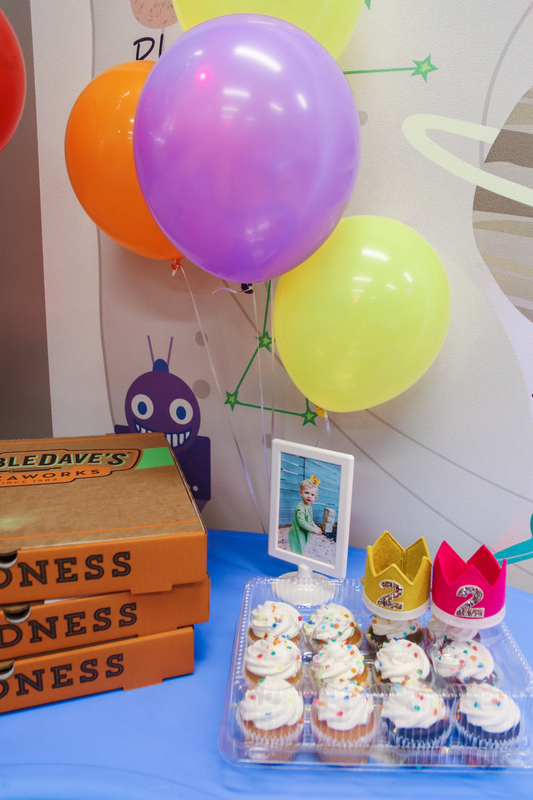 When I've had parties at Catch Air, I ordered pizza and balloons from them and when we showed up everything was set up. They provided plates, drinks, utensils, and the best part is our dedicated party coordinator set it all up and took it all down! 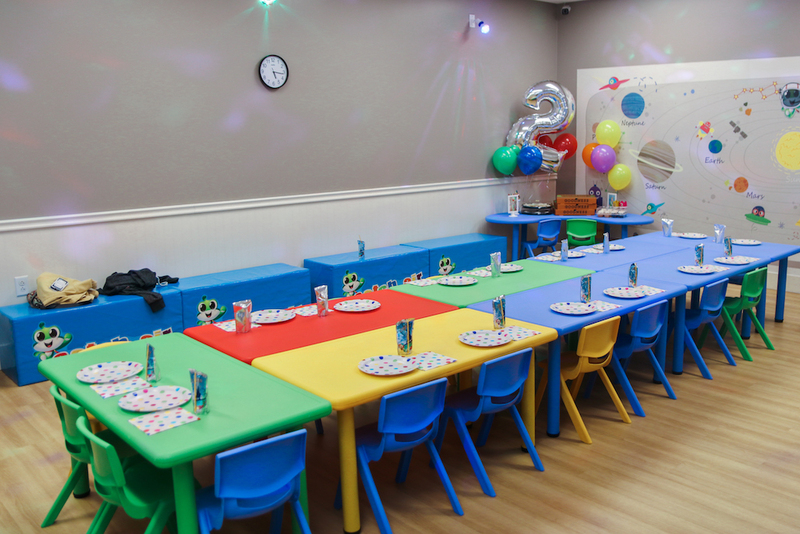 The birthday kid gets to play their favorite song on the light up dance floor, and you can even make a cute photo slideshow which plays during the song. 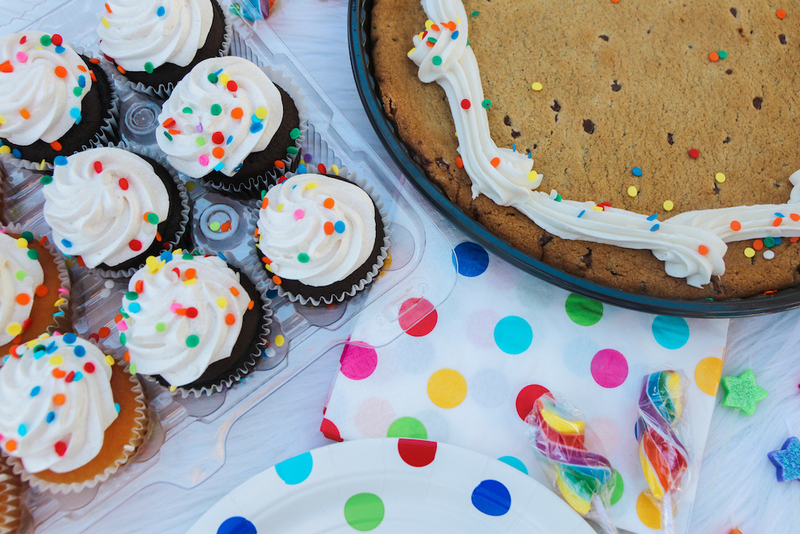 Having a party coordinator to help serve food, cut cake and clean up is a game changer. I was able to spend more time focusing on my kids and chatting with family and friends. Whether you decide to go all out or keep it simple, don't feel guilty either way. We're all doing our best! At the end of the day our main goal as parents should be for our children to feel special and loved on their birthday. Don't worry if it's not Pinterest worthy! This post was sponsored by Catch Air, but all thoughts and opinions are my own. Thank you for supporting the brands I love!